The annual cyber-storm has swept into town once again, leaving a path of marketing debris in its wake. 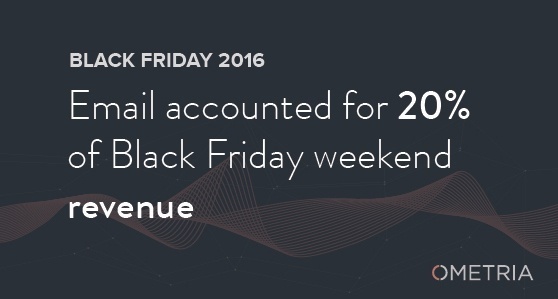 With online sales this Black Friday breaking the £1bn mark for the first time, the busiest day of online shopping ever (according to Experian) left its mark, in our inbox. We all know how important email marketing is to target and lure bargain hunters during this crucial online period - so as the ecommerce world reaches for a tall Bloody Mary following a weekend of non-stop sales and frivolity - we’ve taken a look at our inbox to find the best emails. From cool GIFs to tempting subject lines, take a look at our favourites. The integration of social into any campaign is crucial. It hands your marketing message to the consumer and triggers an online conversation that drives prospects to your landing page - for free. This year, Oasis scrapped Cyber Monday in favour of “Social Monday” in a bid to funnel its email subscribers onto its social channels. Users were encouraged to follow their social pages, and in return, they were granted discounts as a thank you - a very clever way of hijacking an event for social gain. Kurt Geiger also did a good job with social, embedding an “As Seen On: Instagram” feature into its campaign - which will no doubt delight the fashionistas which often frequent the picture-sharing tool. After scrolling through countless static emails, a simple GIF is a very simple way of grabbing the attention of weary browsers - especially at this time of year when inboxes are buried under a mountain of marketing junk. We loved Boden’s funny and inventive GIFs, which truly brought their products to life. Everyone enjoys some festive sparkle, and this email from Kate Spade definitely lit up our cold winter inbox. Not for the faint-hearted, this email from Nasty Gal packs a punch. Like the first coffee of the day, this GIF perked up our morning and made us ready for discounted online warfare. The subject line is a hard art to master. There’s not a secret to its success, yet it is arguably the most important part of your email campaign. Scrolling through the endless “last chance” saloon of Cyber Weekend marketing, this simple wink from ASOS got us excited. “Beauty is the promise of happiness,” said Edmund Burke, once. Well if that is true, then this email design from House of Hackney makes us very happy. We loved the “eight days of YASS” countdown Steve Madden used in their Cyber Weekend campaign. With the promise of a surprise gift each day, mixed with colourful visuals and a sense of urgency, this certainly got us clicking - and singing a different Christmas tune. Following a weekend of online overspending, it’s likely that your finances will have suffered in the pursuit for cheap electronics and winter coats. 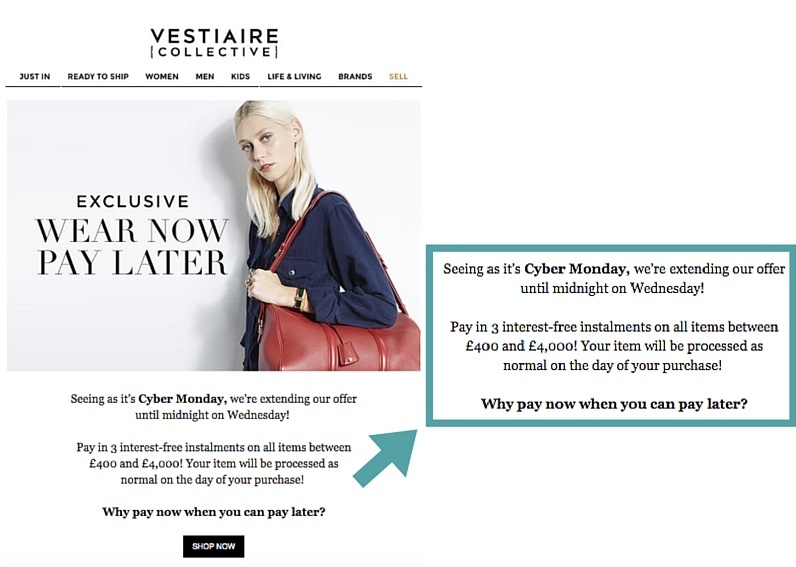 Your bank account will be pleased, therefore, to see brands such as Vestiaire Collective offering an interest-free payment plan into their campaign. Get personal. With hundreds of branded campaigns battling for clicks, a quick salute to the recipient will get you noticed. The busiest time for online shopping also means the busiest time for email inboxes. Knowing your customer's name and shopping history will help you target their needs, capture their attention and ultimately, sell. Be different. 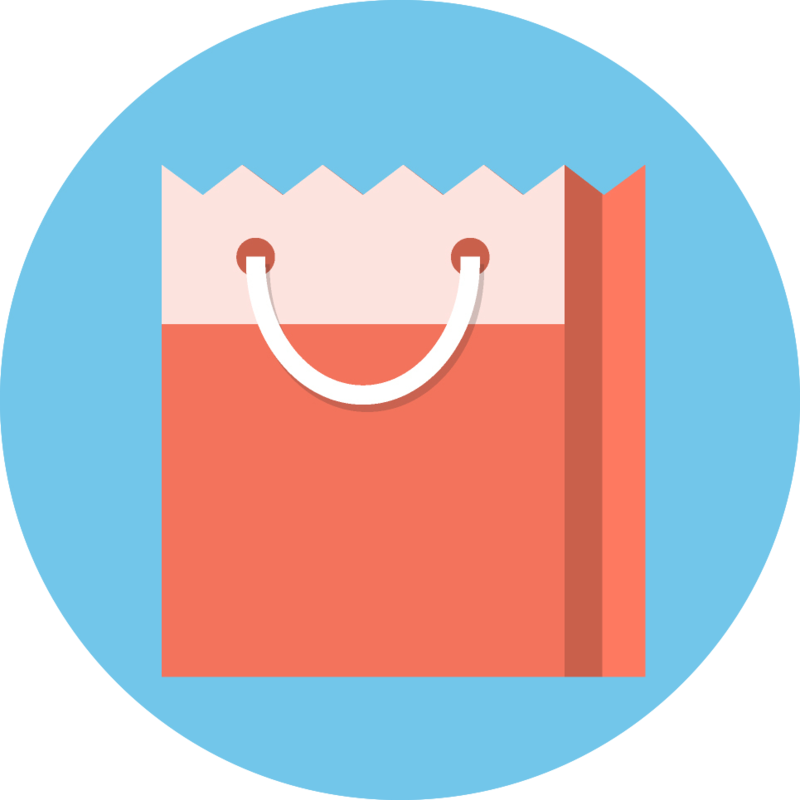 The savvy online shopper is not faithful, they will probably be subscribed to all of your biggest competitors - don’t take it personally. On Black Friday weekend, every online company is battling for the click button in inboxes across the world - instead of delivering the predictable, try and stand out. From cool GIFs to intriguing subject lines - be different. Get GIFing. GIFs are one of the most effective ways to bring energy to an inbox void of life. Like a moth to a flame, subscribers love high-energy, vibrant emails that stimulate the senses and ultimately draw attention to key products.